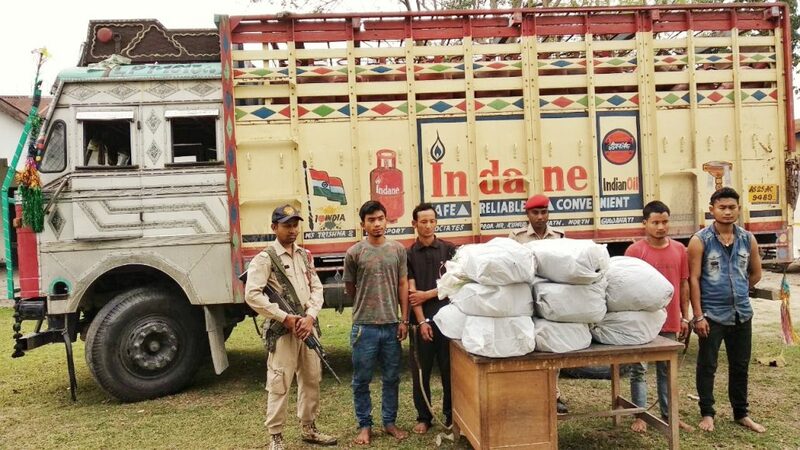 The Udalguri Police acting on a tip off, on Saturday night intercepted one truck carrying empty LPG cylinders and seized a consignment of suspected cannabis (ganja) at Lalpool area under Lalpool Police outpost in Udalguri. According to a police source, after getting an input over the movement of the supplier through the National Highway 15 in the district, the police swiftly intercepted the truck bearing registration number AS-25-AC-9489. On thorough searching the police team recovered 74 kg of suspected cannabis which was well packed in plastic bags. Meanwhile, four persons have been apprehended in this connection. They have been identified as Ripon Baglary (26), son of Dibson Baglary, a resident of Landangpara in Udalguri; Biru Boro (18) son of Subon Boro, a resident of Nichlamari under Orang police station in Udalguri; Ronsai Goyari (26) son of Reben Goyari, a resident of Kathpuri under Orang police station in Udalguri; and Arbin Daimary (24) son of Khagen Daimari, a resident of Kathpuri under Orang police station in Udalguri. Police informed that the consignment of drugs was coming from Kalaktang of Arunachal Pradesh. The organized cultivation and harvesting of ganja in Arunachal Pradesh for commercial purpose has been an emerging trend. The district has been used as a transit point by the network of organized drug peddlers.